Green Fins Association still continues to establish the Marine Litter problem to the public and local community. The solution will not be easy and it takes a very long time to educate the local people, increase the public awareness and change people behavior. 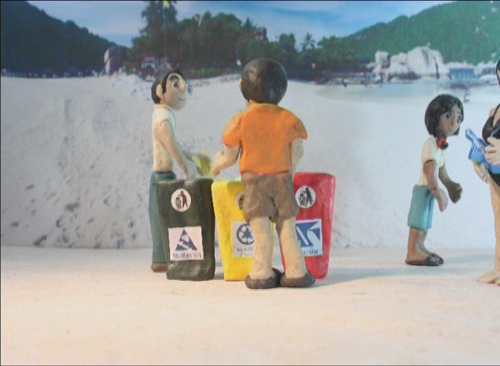 In 2009 Green Fins Association in cooperation with the Department of Marine and Coastal and Resources conducted a competition of 3 kinds of media 1) one minute short movie 2) poster and 3) T-shirt designed under the campaign “Beautiful Clean Beach without Plastic”. It was successful that we had substantial participants and we have made use of those works for different activities and occasions purposely to raise public awareness on marine debris. This year we were granted fund from the government through the Office of Contemporary Art, Art and Culture Ministry to produce animation movie under the title “Gift from the Sea” which is about Marine Debris. The budget was just adequate for us to do the production in such a short period of time. There was no budget to publicize the movie on the television but enough to produce CDs. We also provided subtitle in English and will look for possibilities to have it translated into different languages in order to publicize it worldwide. Our challenge is to find channels to publicize and introduce the campaign to encourage our people to stop taking from and littering into the Ocean. The animation movie “Gift from the Sea” contains 5 series: Me & the Sea, Beach Activities: Creative or Destructive, Marine Lives in Crisis, The Missing Chain and I love the Sea. Each episode is 5 minutes long. It presents the marine debris problem in order to stimulate people awareness, to take better care of the sea and to know how to tackle marine debris. The movie is aimed for the children and the young generation in order to embed sense of belonging and personal responsibility for their livelihood and the sea. It emphasizes that we all have responsibility to solve this problem. “Gift from the Sea” also demonstrates the fishermen’s’ livelihood. 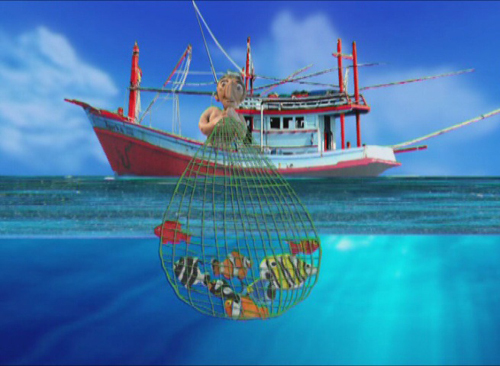 The traditional Thai music used in this movie is to build conservation awareness, its meaning urges for urgent action to protect and preserve the sea. 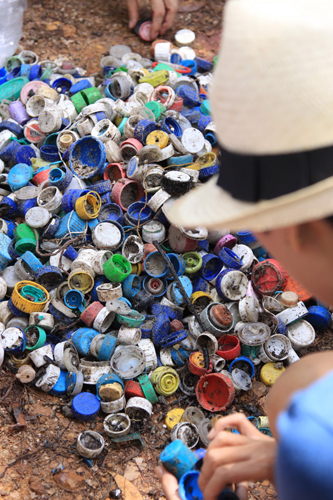 It also highlights marine debris problem and the impact to the economic, environment, culture and social aspect. 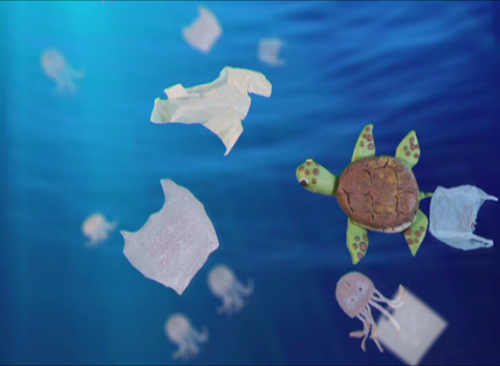 The introduction of Marine Debris to the children aged 10-11 years old, we plan to train the school children to stop littering, start to separate the garbage, and form a local community to work on garbage management. What I am proposing is to educate the young generation to stop Marine Debris from where it is originated. We are addressing Marine Debris which mostly is believed from beach activities, so we will involve the locals who grow up, live & work by the seaside and depend on tourism for their livelihood as well as the tourist who are the outsiders. Surprisingly we found lots of household items such as combs, toothbrushes, toothpastes, liquid soap bottles, shampoo bottles, clothes hangers, clothes holder, measuring spoon for milk powder and detergent, shoes, as much as those items from tourists and beach activities. The OC/ICC data card will be used as a tool to teach the target audiences on a simple method to identify where most of the marine debris comes from. They will learn and understand who pollutes their beach and how to eliminate the Marine Debris. The whole process will involve the target audiences combining the school children in Rawai District and their parents to form a group called “Natural Resources and Environmental Protection Volunteer (NEV) – Rawai District in Phuket. In the previous days, these people were local fisherman but now they earn their living from the tourism industry. At the end they all will find and design their ways to protect their own beaches from the irresponsible tourists. 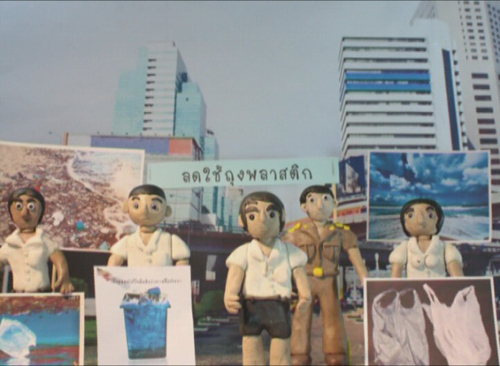 One of many possible ways to educate people and raise their awareness on Marine Litter problem is through the exhibition. 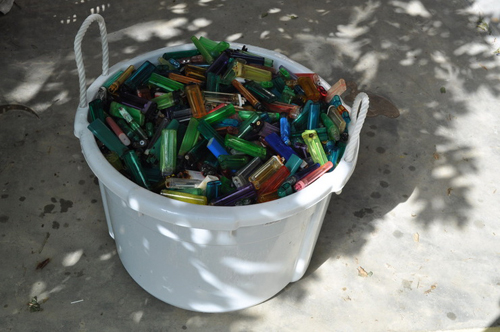 The recent International Coastal Cleanup Day which we organized on behalf of the Department of Marine and Coastal Resource, we were able to remove 3,502 caps & lids and 1,033 lighters from the 2 km long beach. This year, what we have done further than the previous years was to bring the recycle center to collect the garbage that can be recycled such as glasses, metal and caps & lids. Most of the marine litters cannot be recycled because they are filthy, torn apart and broken especially plastics. 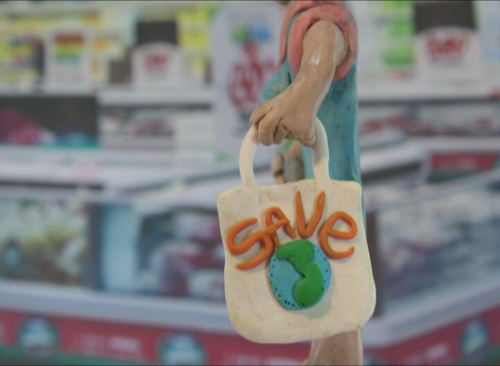 We thought of making art pieces and souvenirs from the collected garbage such as shoe (singular), lighter, broken glass, buoy, Styrofoam, etc and exhibit them at the museum as well as selling them at the museum’s souvenir shop. With all the collection I have been saving and the newly removed from the recent cleanup activities will be used as materials for the designed art pieces. At the clean up & garbage separation activities we organize for the school children, we can encourage them to design and make art pieces from the garbage they collect. Their work will also be part of the exhibition. The exhibition will be exhibited from one museum to another or from one place to another. Each of the art pieces will have a poster or a postcard explaining about its origin, how it was used and how it ended up in our ocean for example the lighter. Further campaign addressing the issue will be directed to those who are directly relevant to the garbage such as cigarette producer and smoker. Another example, short nylon strings and Styrofoam usually found on the beach, we will explain how it was used, by whom and why such large volume were found everywhere on the beach. Even though there are many projects going on addressing marine litter, the government has not paid enough attention to cope with this problem. We cannot wait but to keep sending the message through different media, educating children and raising public awareness. As a Kayaker & a person who has interacted with our planets waters for over 40yrs seeing what has & is happening to our Oceans,Seas,rivers,canals,Lakes,Drains, Dikes & all water courses I can NOT tell you how leased I am to see & read your website. I can NOT believe the amount of litter & garbage that is in our worlds waters & all the fly tipping that goes on along & within our rivers flood defences. I hope that you are going to go world WIDE!! Terry, UK, local river, The wonderful river Trent. I love it!